Published on Thursday, May 31, 2012. 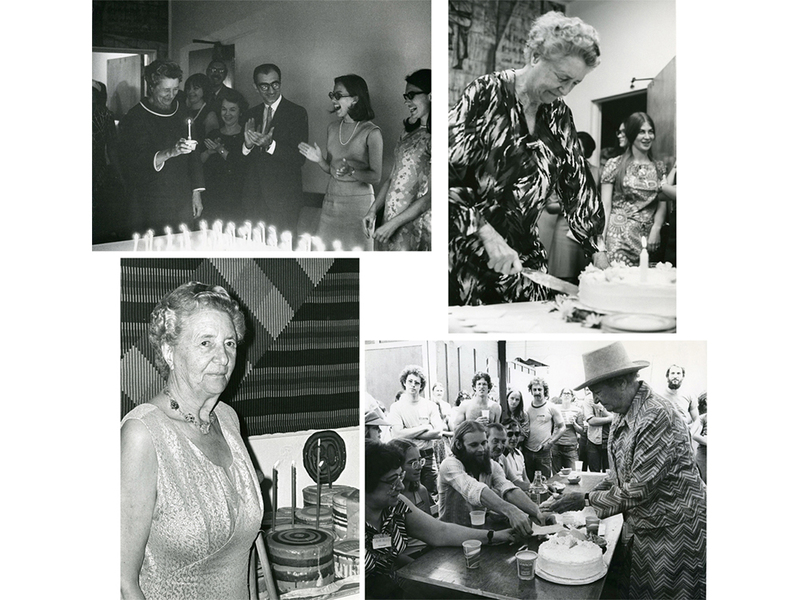 Aileen Osborn Webb, founder of the American Craft Council, celebrating a few of her many birthdays at various ACC events. Mrs. Aileen Osborn Webb, founder of the American Craft Council, was born in Garrison, New York, to Alice Dodge Osborn and William Church Osborn, a New York lawyer who was president of the Metropolitan Museum of Art and the Children’s Aid Society. She attended the Chapin School in Manhattan and studied in Paris before marrying Vanderbilt Webb, a lawyer and a descendant of Commodore Cornelius Vanderbilt, the 19th century railroad magnate, at the age of 20. They maintained an apartment in Manhattan, a house in Garrison, and summered in Shelburne, Vermont. Mrs. Webb, who was well-to-do in her own right, first became active in crafts during the Great Depression. In 1930, she organized a home-based relief project called Putnam County Products, which helped find markets for her neighbors’ farm and dairy products, preserves and such handmade products as pottery and quilts. A large inheritance from a maternal aunt – an heiress to a copper fortune – provided the seed money for these and other ventures, including the American Craft Council, the Museum of Contemporary Crafts (now the Museum of Arts and Design) and the World Crafts Council. Mrs. Webb was active in all three of these organizations until her death in August 1979. It is evident from the countless birthday photographs that can be found in the ACC archives that Mrs. Webb loved to celebrate the coming of a new year in one’s life. No matter where she was – at the Council, the museum, a craft show or WCC gathering – it seems a celebration complete with cake and candles was in order. The first annual national competition entitled “Young Americans” opened. Conducted by the Educational Council, “Young Americans” was held at America House June 7th-8th, and featured 175 pieces out of 200 entries, with three cash prizes awarded to: Henry J. Bayer (wood table); Edward G. Dykstra (silver pitcher); and Ken Uyemura (ceramic jar). Finalists were selected by a jury composed of well-known designers, craftspeople, curators, gallery directors, and/or educators. The competition – for craftsmen under 30 - occurred annually through 1956 and again in 1958, 1962, and 1969. It was presented in media segments in 1977-79, with award winners in all media shown at the American Craft Museum in 1982. The last “Young Americans” exhibition was held in 1988. The goal of “Young Americans” was to discover and develop new talent as well as give young craftspeople an opportunity to see the work of their peers. In later years, the Museum of Contemporary Crafts exhibited the competition winners, and the show traveled to other art and craft museums around the country for one to two years. The artists selected as “Young Americans” over the years were like a who’s who in contemporary crafts. Some examples include: William Daley, Karen Karnes, Earl Pardon, Betty Cooke, and Gernardt Knodel. The proceedings from this conference were published and are now available online through the ACC Library Digital Collections. By creating a forum for artists to assemble, Webb’s hope was that they would trade techniques, sources, materials, practices, and experiences and learn from each other’s work. 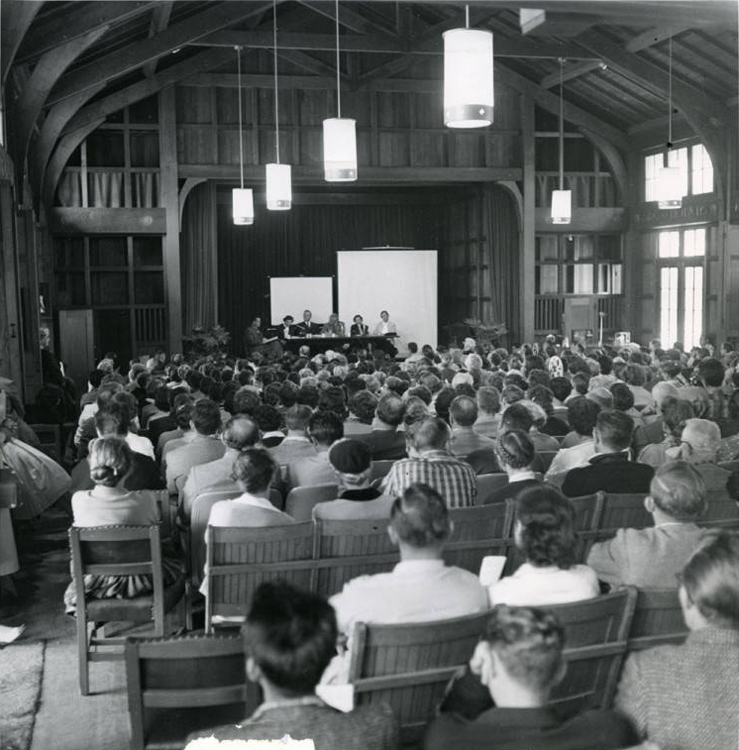 The success of the Asilomar conference in 1957 led to others held every few years, the most recent in Minneapolis in 2009. The national gathering also paved the way for numerous regional conferences, programs, and workshops that were based on the Council’s model. Many independent regional groups and organizations affiliated with the ACC expanded and emerged from 1960 into the late 1970s. For the first time, the Council honored 17 people who contributed significantly to the American craft movement. Called Fellow of the ACC, they were inducted into what would be known as the Academy of Fellows at the Council’s annual meeting held simultaneously in New York and San Francisco by telecommunication. 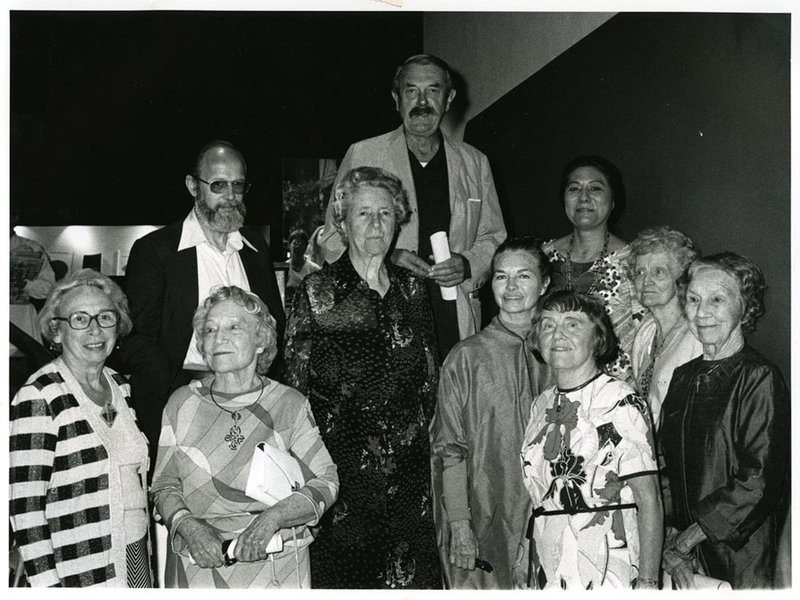 Honored as the first Fellows of the American Craft Council were: Lili Blumenau, Florence Eastmead, Trude Guermonprez, Adda Husted-Andersen, Harvey K. Littleton, Mary Lyon, Sam Maloof, Dorothy Meredith, Francis Merritt, Margaret Patch, Maurine Roberts, Ed Rossbach, Rudolf Schaeffer, Toshiko Takaezu, Lenore Tawney, Peter Voulkos, and Frans Wildenhain. An ACC committee nominated these Fellows and those elected in 1976; in subsequent years the Fellows themselves elected their peers. Today the College of Fellows has 285 members and is still a highly recognized honor given biannually by the American Craft Council as part of the Aileen Osborn Webb Awards. Recepients are craftspeople who have demonstrated outstanding artistic achievement, leadership, and service in the craft field. Included are those with the designation of Honorary Fellow, which signifies an individual who in other ways has made an important contribution to craft. Those elected to the College of Fellows must have worked 25 years or more in the discipline/career in which he/she is being recognized. This year, ACC will induct eight individuals into our College of Fellows – look for the official announcement of who’s included in the 2012 cohort in our October/November issue of American Craft magazine! “This Month in ACC History" takes a look at events from the American Craft Council's 70-year history that shaped not only the organization but also the contemporary craft movement in America. 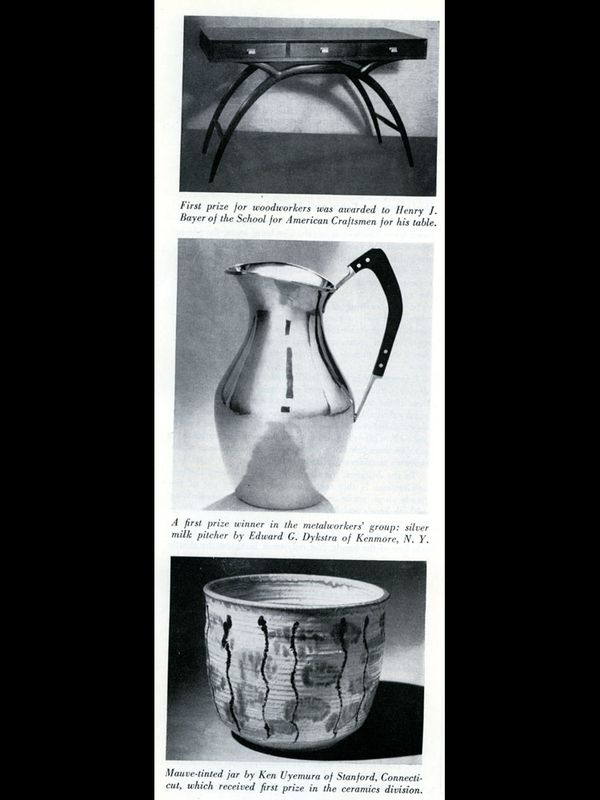 A page from the Fall 1950 issue of Craft Horizons magazine showing the "Young Americans" award winning objects. 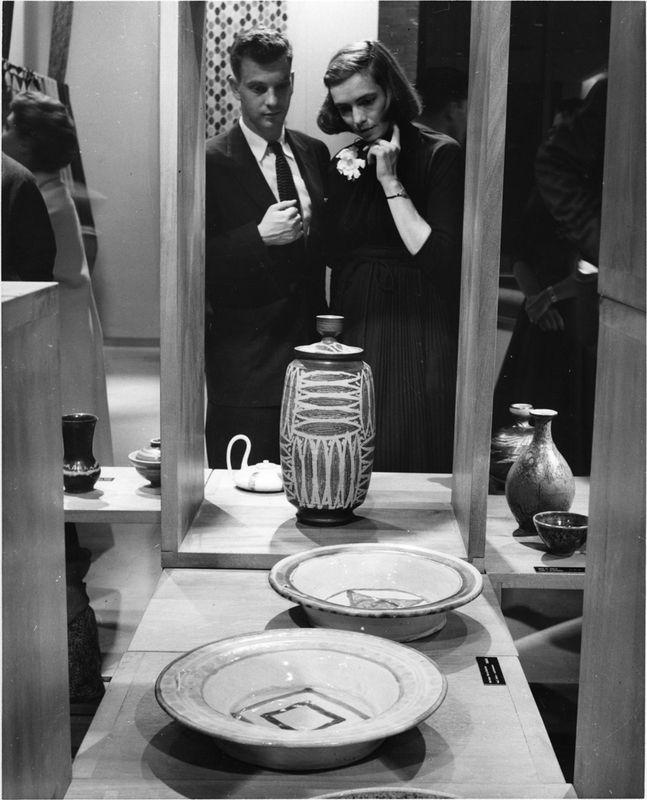 A young couple take in an exhibition of objects from the "Young Americans" competition. 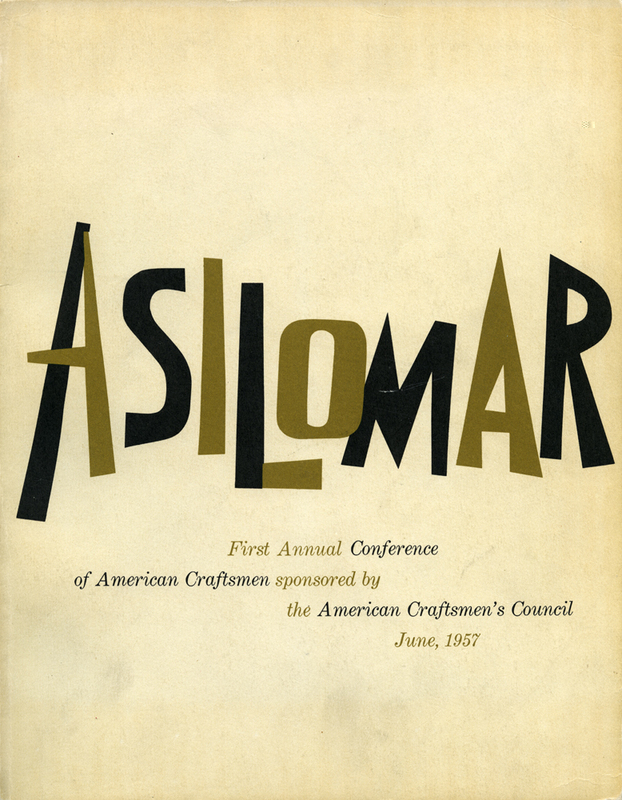 Cover of the proceedings for the First Annual Conference of American Craftsmen, held at Asilomar, California in June 1957. To view the entire proceedings, please visit the ACC Library Digital Collections.